The material in this pamphlet is reprinted from the May 1943 issue of the Bureau of Naval Personnel Information Bulletin and is a full summary as of that date. The color plate in the center of the pamphlet may be removed for display without damaging the rest of the contents. Restoration of the rank of commodore during the past month and the recent creation of new rates and insignia to meet the needs of the rapidly-expanding naval service have focused attention on the whole related field indicated by the above title. The following material has been gathered by the INFORMATION BULLETIN from official publications and Bureau sources as a general reference on the subject. Precedence of rank of officers is shown on the insignia plate between pages 4 and 5, the commodore, a flag officer, ranking between rear admiral and captain. There has been one other change in the precedence of naval personnel above enlisted ranks. The aviation cadet, formerly ranking with but after the Midshipman, is now classified as an enlisted man in a special category wearing the officer's uniform without a stripe, and now ranks after a warrant officer but before a chief petty officer. The Aviation Cadet is in a special enlisted grade. Aviatoin Cadets or their beneficiaries are entitled to the same alllowance, pensions, gratuities or other benefits as enlisted men of the fourth pay grade. Regular officers of the Line carry only "USN," while Regular Navy staff officers carry corpos designations as well. Reserve officers of Line or staff use designations shown on page 4. The staff corps include Medical Corps (MC), Hospital Corps (HC), Supply Corps (SC), Chaplain Corps (ChC), Civil Engineer Corps (CEC), and Dental Corps (DC). More detailed material concerning both officer and enlisted precendence and designations, together with insignia and specialites will be found under separate headings in these pages. Because duties vary with the type and size of ship or activity, no exact description can be given of the responsibilities of the different ratings for enlisted men. The following descriptions, however, are applicable in general. AEROGRAPHER's MATE--Reads meteorological instruments. Interprets weather data, and draws weather charts for forecasting weather conditions. AVIATION ELECTRICIAN'S MATE1--Installs, inspects, maintains, and repairs all electrical equipment in aircraft. AVIATION MACHINISTS'S MATE1--Maintains and repairs aircraft engines, propellers, fuel systems, brakes, hydraulic system, gears, starters. Operates machine shop tools. AVIATION METALSMITH1--Repairs and maintains airplanes and aircraft parts other than engines and ordnance. AVIATION ORDNANCEMAN1--Maintains and repairs aviation armaments. Handles and stows explosives. AVIATION PILOT1--Acts as pilot or co-pilot of planes and airships. Does aerial navigation. AVIATION RADIOMAN1--Operates radio transmitting and receiving equipment of Naval aircraft. Maintains and cares for radio batteries. Enciphers and deciphers Navy code messages. Adjusts direction finders. AVIATION RADIO TECHNICIAN1--Maintains and repairs aviation radio equipment and equipment using vacuum tube and other radio-type parts. BAKER--Operates ovens. Does any kind of baking, operates all baking apparatus, takes charge of ship's bakery. BANDMASTER--Trains musicians, conducts band or orchestra, prepares musical arrangements and musical programs. Plays several instruments. BOATSWAIN'S MATE--Supervises deck divisions and large groups of seamen. Usually acts as senior petty officer of deck divisions. Supervises manning and operation of loading and unloading gear, anchor, and mooring gear. BOILERMAKER--Repairs and tests fireroom and boiler equipment, renews parts, repairs boiler plates and brickwork of boilers. BUGLEMASTER--Trains buglers. Acts as drum major and instructs bugle corps. CARPENTER'S MATE--Does carpentry and joinery work; repairs ore replaces deck planking and other woodwork. Lays and repairs tiling. Repairs and maintains small boats. Caulks seams. COMMISSARY STEWARD--Supervises ship's galley. Takes complete charge of foodstuffs. Plans menus. Keeps records. Directs cooking and preparation of foods. Buys food. Directs storing of provisions. COOK--Prepares food for officers' mess. COXSWAIN--Handles small boats and supervises small groups of seamen on deck or bot duty. ELECTRICIAN'S MATE--Stands watch on main switchbord, main gyro compass, and in main control room of electrically driven ships. Maintains and repairs electrical circuits and electrical equipment. FIRECONTROLMAN (M)--Tests, maintains, and repairs electrical and optical fire-control equipment. FIRECONTROLMAN (R)--Stands rangefinder watch. Spots vessels or aircraft, using optical equipment. FIREMAN--Fires the bolers. Maintains fireroom equipment. Also operates boat engines. FIRST MUSICIAN--Assists Bandmaster in preparing musical arrangements and in training and rehearsing band or orchestra. Palys instrument, including solo parts, in band or orchestra. GUNNER'S MATE--Maintains guns, gun mounts, and gun prts. Acts as gun crew chief of small gun or member of crew of larger gun. HOSPITAL APPRENTICE--Does nursing under supervision, prepares and administers simple medicines, maintains sanitary conditions. MACHINIST'S MATE--Operates, maintains, and repairs main and auxiliary engines, steering engines, anchor machinery, turbines, pumps, and related equipment. Repairs machine equipment, using machine and hand tools. Hospital Apprentice, second and first class. Specialist (S) (Supervising enlisted women). Apprentice seaman (rating held while enrolled in school). piping. Draws out, tempers, anneals, and case-hardens metals. Makes plans, time and cost estimates. MOLDER--Makes molds and cores for ship and machinery castings. Operates small foundry. MOTOR MACHINIST'S MATE--Operates, maintains, makes adjustements and repairs on diesel and gasoline engines. Adjusts and overhauls diesel and gasoline engines and parts. MUSICIAN--Plays an instrument in a band at ceremonies and while marching in military formation, and in band or orchestra for entertainment. PAINTER--Prepares and applies paints and varnishes. Lays and repairs tiling. Estimates painting jobs. PARACHUTE RIGGER--Packs and repairs parachutes, life rafts, life jackets, and cargo chutes. Repairs fabric equipment usedin aviation and flight clothing. Uses sewing machine. PATTERNMAKER--Executtesx intricate patterns for molding metal castings. Estimates time, materials, and cost in patternmaking and casting. Does fine woodwork. PHARMACIST'S MATE--Renders medical assistance and administers to patients. Assists in surgery, eye-ear-nose-and-throat, out-patient department, physiotherapy, or drug dispensing. Compounds drugs, makes laboratory analyses, and assists in hospital administration. PHOTOGRAPHER'S MATE--Operates "still" and motion-picture cameras, taking pictures under all conditions. Does darkroom and related work. PRINTER--Operates printing equipment, duplicating equipment, and book binding equipment. QUARTERMASTER--Stands bridge watch. Prepares and computes navigational data. Applies navigational data to charts. Plots courses. Supervises bridge crew. RARADMAN--Stands radar watch and remains alert through long periods. Uses and regulates radar equipment. Converts relative bearing to true bearing and reads ranges. Reads and plots polar coordinates. RADIOMAN--Sends and receives messages by code or radio phone. Uses typewriter. Makes minor adjustments and repairs to radio receivers and transmitters. RADIO TECHNICIAN--Maintains and repairs radio, radar, sound and other radio-type equipment. SEAMAN--Performs ordinary deck duties in connection with the upkeep and operations of a ship. Stands watch as look-out, telephone talker, messenger, or simillar duty. Member of gun crew. SHIPFITTER--Usees hand and machine tools of shipfitter's shop to lay out metal sheets and sections for repairs to ship's structure. Bends, repairs, and fits pipes, tubing, and structural sections. Does forging, welding, soldering. SHIP'S COOK--Supervises and prepares food for general mess. Operates all cooking apparatus. Inspects provisions. Plans menus. Is responsible for food storage. SIGNALMAN--Sends and receives messages by flaghoist, flashing light, and semaphore. Stands watch on signal bridge. Does "spotting" work, identifies vessels and aircraft. Assists Quartermaster on small ships. SOUNDMAN--Operates special sound detection equipment, and interprets sound characteristics of echoes. SPECIALIST A--Conducts and organizes physical fitness drills. in charge of physical training program and competetive sports program. SPECIALIST C--Interviews, tests, and classifies enlisted personnel. SPECIALIST G--Trains aviation and small-arms gnners on moving targets. SPECIALIST I--Supervises or operates mechanical tabulation equipment. SPECIALIST M--Operates Naval post offices. SPECIALIST O--Inspects ordnance matériel at manufacturing and assembly plants. SPECIALIST P--Does special "still" and motion-picture photographic work and photographic process printing. SPECIALIST R--Assists in the recruiting of Naval personnel. SPECIALIST S--Patrols shore and port areas where there are a large number of naval personnel on leave or living among civilian populations. WAVE Sp(S) is barracks leader responsible for discipline and general welfare. Acts as recreational leader and personal counselor. SPECIALIST T--Instructs in or performs duties in special technical or scientific fields. SPECIALIST V--Employed in airport operations for air transport service. SPECIALIST W--Assists in the office of the Chaplain in clerical work and in social welfare. In charge of religious music. STEWARD--Takes charge of officers' mess. Arranges menus, prepares food, and supervises the purchase and service. Supervises the work of the steward's mates. STERWARD'S MATE--Serves at table in officers' mess. Takes care of officers' quarters and laundry. STOREKEEPER--Operates a stockroom or store, or an accounting system. Handles fiscal and matériel accounting, under supervision of supply officer. TELEGRAPHER--Operates teletype and telegraphi equipment on shore stations. TORPEDOMAN--Maintains and repairs torpedoes, torpedo parts, control mechanisms, and torpedo equipment including directors and air compressor systems. Handles and maintains ndepth charges. Tests, operates, and repairs hydraulic release gears and release tracks. TURRET CAPTSAIN--Takes charge of a gun turret and its crew. Does assembly and repair work on all types of Naval guns. Handles ammu7nition. Operates periscopes and range finders. Understands electric fire control and firing mechanisms. WATERTENDER--Takes charge of boiler room. Supervises firemen. Maintains and operates boiler room equipment including pumps, condensers, etc. Performs repairs on boiler room equipment. YEOMAN--Performs typoing, stenographic, clerical and other office duties. Distinguishing marks are prescribed as sleeve marking for men who have met certain qualifications additional to those required for their rating, or who are members of a crew that hs attained a specified merit in certain prescribed competitions. Distinguishing marks are embroidered in silk, in white on blue for blue clothying and in blue on white for white clothing. AIR GUNNER--Men who have successfully completed the prescribed course in air gunnery, or who have qualified in accordance with standards approved by the Bureau of Naval Personnel, wear the Air Gunner's mark, a winged machine gun, midway between the shoulder and elbow of the left sleeve for men of the seaman branch and onthe right sleeve for others. AIRSHIP--Enlisted men qualified for lighter-than-air airship duty are entitled to wear a blimp on the right sleeve midway between the wrist and elbow. AVIATION UTILITY--All enlisted personnel assigned to aviation duties wear a winged insignia midway between the wrist and elbow, on the left sleeve for men of the seaman branch and on the right sleeve for others. BOMB SIGHT MECHANIC--Men who have qualified as bomb sight mechanics wear a singed B midway between the should and elbow, or one inch below the rating badge, on the left sleeve for men of the seaman branch and on the right sleeve for others. CB--Rated menin the Seabees wear, midway between the wrist and the elbow upon the arm on which their rating insignia appears, the block letters "CB." EX-APPRENTICE--Enlisted men who have passed through the rating of apprentice wear the mark on the breast of jumpers just below the loop holding neckerchiefs. Chief petty officers wear it on the coast sleeve under the rating badge midway between the elbow and wrist. EXPERT RIFLEMAN AND PISTOL SHOT--Enlisted men who have qualified as expert riflemen and/or expert pistol shots wear a target on the right sleeve about midway between the wrist and elbow. Rifle sharpshooters wear the same mark except the inner ring is omitted. GUN CAPTAIN--A man regularly detailed by the commanding officer of a vessel as a gun captain, except of a secondary battery gun (less than 4-inch), wears a gun, axis horizontal, muzzle pointing forward, midway between the shoulder and elbow on the left sleeve for men of the seaman branch and on the right sleeve for others. GUN POINTER--Men who have qualified as gun director pointers or gun pointers, first or second class, wear a mark of cross wires of a gun sight midway between the shoulder and elbow of the left arm for men of the seaman branch and right arm for others. Gun director pointers, first class, and gun pointers first class, wear a star one inch above the mark. GUN RANGE-FINDER OPERATOR--Men who have qualified as gun range-finder operators wer a range-finder midway between the should and elbow on the left arm for men of the seaman branch and and on the right arm for others. MASTER DIVER--Men qualified as masster divers wear the diving helmet with breast plate with the letter "M" on the breast midway between the should and elbow of the left sleeve for men of the seaman branch and on the right sleeve for others. Divers, first class, wear the mark without the "M."
MASTER HORIZONTAL BOMBER--Men who have qualified as master horizontal bombers wear cross wires of a gun sight with a falling bomb in the center midway between the shoulder and elbow of the left sleeve for men of the seaman branch and on the right sleeve for others. NAVAL MINE WARFARE--All graduates of the Mine Warfare School who meet certain qualifications wear, midway between the wrist and elbow on the right sleeve for those of the seaman branch and on the left sleeve for those of the artificer branch, a mine and anchor. NAVY E (C)--Members of turret, gun, mine and torpedo crews and ship and fire-control parties and members of the engineer's force who have madeexceptionally high scores in special forms of gunnery exercises or excellence in engineering wear the Navy E. Men of the communications branch wear a Navy C for excellence. The mark is worn on the right sleeve or men of the seaman branch and on the left by others. Any personnel who have received consecutive awards for efficiency in gunnery, engineering, or communications are authorized to wear a horizontal br under the mark for each consecutive award. PARACHUTE MAN--Qualified enlisted men who have graduated from one of the Navy's parachutue schools are entitled to wear the insignia of a Parachute Man, a descending parachute, halfway between the wrist and the elbow on the left sleeve. SEAMAN GUNNER--Men who have qualified as seamen gunners and men who attended the Seamen's Gunner's School wear a mark of a bursting shell midway between the shoulder and elbow on the right sleeve or one inch below the rating badge. 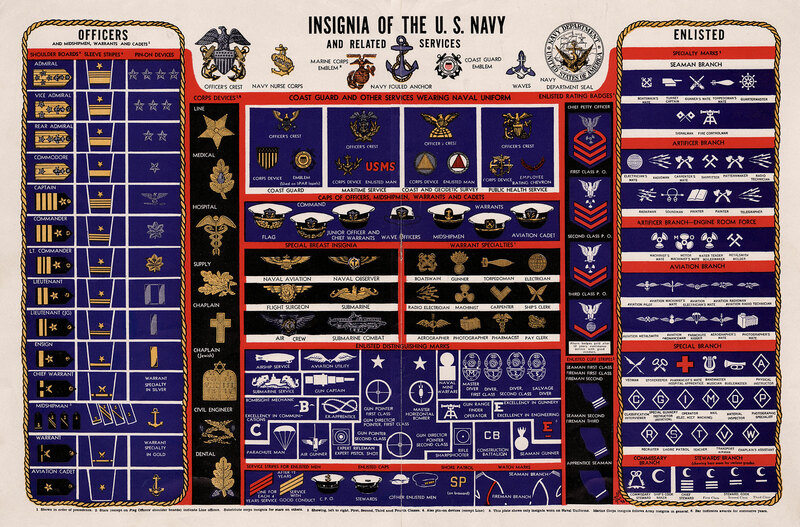 SUBMASRINE--Enlisted men who hve qualified for submarine duty are entitled to wear the submarine insignia on the right sleeve, midway between the wrist and elbow. NAVAL AVIATOR'S INSIGNIA: A gold embroidered or bronze gold-plated metal pin, winged, foul anchor surcharged with a shield. The embroidered device shall be on a black background. It is worn on the left breast of officers who have qualified as naval aviators. NAVAL AVIATION OBSERVER'S INSIGNIA: Officers holding designation as naval aviation observers wear the same insignia as for a naval aviator asto gold wings, but the central device shall be an "O" circumscribing an erect plain anchor, both in silver. The "O" and the anchor to be in bold relief; the center of the "O" being filled with gold. FLIGHT SURGEON'S INSIGNIA: Officers of the Medical Corps who have qualified as flight surgeons wear insignia similar to the navla aviator as to gold wings, but the central device shall be a slight convexed oval crest surcharged with gold oak leaf and silver acorns. Worn on the left breast. SUBMARINE INSIGNIA: A bronze gold-plated metal poin showin bow view of a submarine proceeding on the surface with bow rudders rigged for diving, flanked by dolphins with their heads rzsting on upper edge of rudders. Worn byb officers who have qualified in submarines or who have quialified to command submarines. Worn with dolphins horizontal on the left breast, located just above the center of ribbons or medals. AIR CREW INSIGNIA: Authorized for flight crews of Navy palnes who have been duly designated as members of Air Crews. Commissioned and warrant officers who have been designated as Naval Aviators or Naval Observers, and enlisted ratings who have been designated as Naval Aviation Pilots, shall not be eligible to receive or wear the Air Crew insignia. SUBMARINE COMBAT: A silver-plated metal pin showing the broadside view of a submarine proceeding on the surface with a scroll at the bottom upon which gold lstars as merited shall be mounted. 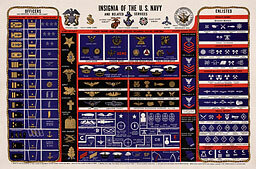 The insignia is tobe awarded to officers and men who complete (or who have completed since December 7, 1941) one or more patrols during which time the submarine sinks, or assists in skinking, at least one enemy vessel, or accomplishes a combat mission of comparative importance. Further successful patrols shall be indicated by gold stars mounted on the scroll, the third star being indicative of four or more successful patrols. Fleet Reserve:: to provide an available reserve of ex-officers and ex-enlisted men of the Regular Navy who may be utilized without further training to fill those billlets requiring experienced personnel in the initial stages of mobilization. Organized Reserve: to provide a trained force of officers and men which added to qualified personnel fromother sources will be adequate in numbers and composition to complete the iunitial war organization of the United States naval forces. Volunteer Reserve: to provide a force of qualified officers and men in numbers which added to the officers and men in other branches of the rserve will be adequate to fulfill the purpose of the Naval Reserve. The Women's Reserve is a component part of the Volunteer Reserve. Merchant Marine Reserve: to provide trained officers and men to serve on seagoing vessels of United States registry when such vessels are commissioned by the Navy in time of war. There are no officers at present in the Fleet Reserve. All organizations of the Organized Reserve having been mobilized for war service, the officers have been transferred to the Volunteer Reserve. A-V (G) Aviation officers of the Volunteer Reserve appointed for general service. A-V (N) Officers commissioned in the Volunteer Reserve and designated as naval aviators upon completion of training as aviation cadets. A-V (RS)2 Aviation officers of the Volunteer Reserve experienced in electrical engineering. AV (S)2 Aviation officers of the Volunteer Reserve appointed for special service. A-V (T)2 Aviation officers of the Volunteer Reserve who formerly were civil aviation pilots or aviators of the Army, Navy, Marine Corps, or Coast Guard. CC-V (S)2 Officers of the Volunteer Reserve appointed for naval construction duties. CEC-V (S) Officers of the Volunteer Reserve appointed for special service in the Civil Engineer Corps. CHC-V (G) Officers of the Volunteer Reserve appointed for general service in the Chaplain Corps. CHC-V (P) Seniors in theological seminaries commissioned as ensigns (probationary) pending graduation, ordination, and commissioning in the Chaplain Corps. CHC-V (S) Officers of the Volunteer Reserve appointed for special service in the Chaplain Corps. C-V (G) Officers of the Volunteer Reserve appointed for general communications service. C-V (L) Officers of the Volunteer Reserve appointed for for communications industrial liaison duties. C-V (S)2 Officers of the Volunteer Reserve appointed for special communications service. C-V (X) Officers of the Volunteer Reserve appointed for communications security duties. DC-V (G) Officers of the Volunteer Reserve for general service in the Dental Corps. DC-V (S) Officers of the Volunteer Reserve for special service in the Dental Corps. DE-M Officwers of the Merchant Marine Reserve holdingn deck and engineering licenses in the Merchant Marine. DE-V (G) Officers of the Volunteer Reserve to the line for general service in deck and engineering duties. DE-V (S)2 Officers of the Volunteer Reserve to the line for special service in deck and engineering duties. D-M2 Officers of the Merchant Marine Reserve holding deck licenses in the Merchant Marine. D-V (G) Officers of the Volunteer Reserve to the line for general service in deck duties. D-V (S)2 Officers of the Volunteer Reserve to the line for special service in deck duties. E-M2 Officers of the Merchant Marine Reserve holding engineering licenses in the Merchant Marine. E-V (G) Officers of the Volunteer Reserve appointed to the line for general service in engineering duties. E-V (RS)2 Officers of the Volunteer Reserve who are experienced in electrical engineering appointed to the line for engineering duties. E-V (S) Officers of the Volunteer Reserve appointed to the line for special service in engineering duties. HC-V (G) Officers of the Volunteer Reserve appointed for general service in the Hospital Corps. HC-V (S) Officers of the Volunteer Reserve appointed for special service in the Hospital Corps. H-V (P) Officers of the Volunteer Reserve appointed in a probationary status who are students in medical or dental colleges. H-V (S) Officers of the Volunteer Reserve appointed for special service and assignment to the Medical Corps. I-V (S)2 Officers of the Volunteer Reserve appointed for special intelligence duties. L-V (S) Officers of the Volunteer Reserve appointed for special legal duties. MC-M Officers of the Merchant Marine Reserve appointed for general service in the Medical Corps. MC-V (G) Officers of the Volunteer Reserve appointed for general service in the Medical Corps. MC-V (S) Officers of the Volunteer Reserve appointed for special service in the Medical Corps. O-V (RS)2 Officers of the Volunteer Reserve experienced in electrical engineering appointed for ordnance duties. O-V (S)2 Officers of the Volunteer Reserve appointed for special ordnance duties. SC-M Officers of the Merchant Marine Reserve, who hold certificates in one of the purser classifications of the Merchant Marine, appointed for general service in the Supply Corps. SC-V (G) Officers of the Volunteer Reserve appointed for general service in the Supply Corps. SC-V (P) Probationary officers of the Volunteer Reserve appointed for duty in the Supply Corps. SC-V (S) Officers of the Volunteer Reserve appointed for special service in the Supply Corps. W-V (S)2 Officers of the Women's Reserve of the Volunteer Reserve appointed for emergency service. F-2 Men assignerd to Fleet Reserve upon completion of an enlistment in regular Navy. F-3-D Men transferred to Fleet Reserve after 16 or 20 years, respectively, whose transfers were effected before July 1, 1925. All these men have subsequently been transferred to the retired list of the regular Navy. F-4-C Men transferred to Fleet Reserve upon completion of 16 years who were serving in the regular Navy on July l1, 1925, or who reenlisted under continuous service immediately thereafter. F-4-D Men transferred to Fleet Reserve upon completion of 20 years who were serving in the regular Navy on July 1, 1925, or who reenlisted under continuous service immediately thereafter. F-5 Men transferred to Fleet Reserve upon completion of 20 years who were not serving in the regular Navy on July 1, 1925. Includes those who first enlisted after July 1, 1925, and those who reenlisted under broken service who did not have a regular Navy status on July 1, 1925. O-1 Enlisted men of the surface component. O-2 Enlisted men of the aviation component. V-1 Men enlisted in peacetime for association with battalions or divisions of the Organized Reserve, or in time of national emergency of war, for active service as required. General Service--Surface Branch. Recruiting discontinued for duration of war. (ACP) College Freshmen, Sophomores, and high-school seniors, enlisted and continued in school. Accredited College Program. Superceded by V-12 Navy College Training Program. (NROTC) Naval R.O.T.C. Students NROTC-V-1. Superceded by V-12 Naval College Training Program. V-2 Men enlisted in peacetime for association with squadrons of the Organized Reserve, or in time of national emergency or war, for active service as required. General Service Aviation Branch. Recruiting discontinued for duration of war. V-3 Enlisted men mostly of Communication ratings comprising the enlisted personnel of the Navy Communication Reserve. Special Service Communication Reserve. Recruiting discontinued. V-4 Enlisted men for the performancen of duties outside the normal scope of their naval ratings. Special Service Intelligence Duties. Recruiting discontinued--RC. L. No. 4-43, Jan. 19, 1943. V-5 Men enlisted in the grade of aviation cadet for flight training leading to naval aviator designations and commission as ensign, AV (N), U.S.N.R., or as second lieutenant, U.S. Marine Corps Reserve. Also includes high school and secondary school boys who have reached 17th birthday who are enlisted as apprentice seamen, Class V-5, for transfer when qualified to Aviation Cadet, V-5, or, if they drop out of school or fail to graduate, transfer to Class V-6. Aviation Cadets. V-6 Enlisted men required for mobilization in addition toother classes of Volunteer Reserve. General Service All Branches. All general Service procurement through enlistment or inductoin made in this class. V-7 Men enlisted as apprentice seamen for V-7 training preliminary to appointment as Reserve midshipmen and future appointment as ensign, U.S.N.R. Midshipmen. V-8 Men enlisted and designated student aviation pilots for training leading to designation as aviation pilot. Aviation pilots. No direct enlistments being made. W-9 Women enlisted as apprentice seamen for training preliminary to appointment as midshipmen and further training for commission in WAVES or SPARS. WAVE officer candidates. W-10 Women enlisted in the WAVES or SPARS for service in the National Establishment ashore, including Coast Guard. WAVES enlisted for service in Enlisted Ratings. V-11 Men who were enlisted pending action on their applications for commission. V-11. Discontinued. V-12 *Successful candidates for Navy College Training program for officer candidates; enlistement in Class V-12 if under 18 years of age, or inducted and enlistedin SV-12 if over 18 years. Navy College Training Program. Tests, April 2, 1943, selected groups reporting to colleges July 1, 1943, and onorabout Nov. 1, 1943. New V-12 Navy College Treaining program will be inaugurated about July 1, 1943, will absorb modt of the college students now enlistedin the Navy and Marine Corps, those who enlisted in the Army Enlisted Reserve Crops with Navy, Marine Corps, or Coast Guard preference and those whoholdl student probationary commissions in the N.R. M-1 Enlisted men of United States Merchant Marine, procured for service in seagoing vessels or in training for such service. M-2 Enlisted men with salvage orseagoing experience procured for service in the local defense forces, or for salvage work. Are also eligible for general duty. BOATSWAIN--Any rating of the seaman branch. GUNNER--Gunner's mate, torpedoman's mate,turret captain, fire controlman, aviation ordnanceman. RADIO ELECTRICIAN--Radioman, aviation radioman, radio technician, radarman, soundman. MACHINIST--Artificer branch, engine-room force, aviation pilot, aviation machinist's mate. CARPENTER--Any rating of the artificer branch or aviation metalsmith. FROM APPRENTICE SEAMAN TO C.P.O. 1May also come from Fireman. 2The rating of AP2c is retained for disciplinary action. 3Designated AP2c after completion of pilot training. in art. 2142-1 (a) S.
1st Chief petty officers with permanent appointments. $138.00 $144.90 $151.80 $158.70 $165.60 $172.50 $179.40 $86.30 $193.20 $200.10 $207.00 $1.25 paid all enlisted men not funished Government quarters; additional $1.25 paid men of first 3 pay grades for dependents prevented by orders of competent authority from living nwith them and not furnished Government quarters. $1.00 paid aviation cadets not subsisted at Government expense; $1.50 paid all other enlisted men not subsisted at Government expense or funished Government messing facilities. Wife alone, $28; wife and 1 child, $40, with $10 for each additional child; no wife but 1 child, $20, with $10 for each additional child; 1 parent, $15, 2 parents, $25; other allowanes listed in S. and A. Memo. 5th Nonrated men, first class (except Firemen, first class, and Musicians, first class). 6th Nonrated men, second class (except Firemen, second class, and Musicians, second class).